Because dogs aren’t able to indicate what their aches and pains are when they are sick, illness can be especially frightening. More via The Puppy Diaries – Added Pain When the Patient Can’t Talk – NYTimes.com. According to Temple Grandin, the revered expert in animal behavior, it’s fine to treat your dog like a child. Read more via The Puppy Diaries – Treating Dogs Like Kids: Temple Grandin Weighs In – NYTimes.com. ALL last week, like clockwork, Scout sneaked into our bedroom and licked my face at 3:25 a.m. Precisely. Talk about an unwelcome wake-up call. More via The Puppy Diaries – It Takes Patience to Raise a Puppy – Web Log – NYTimes.com. We were still digesting our dinner and I wanted to hang out longer with my relatives at our traditional potluck Thanksgiving feast. But I saw Henry looking at his watch: Scout was waiting for us at home. Although my cousin had kindly invited Scout to come along, she’s not yet well-trained enough for us to feel confident that she wouldn’t bring havoc with her. MORE via The Puppy Diaries – Empty Nesters Welcome New Puppy Life – Series – NYTimes.com. LIKE a lot of Americans, I’m obsessing about health insurance. Only in my case, the issue is whether or not to buy pet insurance for Scout. Soon, she will be 6 months old, the age recommended for spaying, a procedure that will probably cost several hundred dollars, once tests and medications are included. A less invasive technique, done through laparoscopy, is far more expensive. And we’ve already spent quite a bit on vaccinations and routine checkups. Then there are possible future expenses, like an accident or a really severe malady, like cancer. More via The Puppy Diaries – Insurance, When the Patient Is a Pet – Series – NYTimes.com. 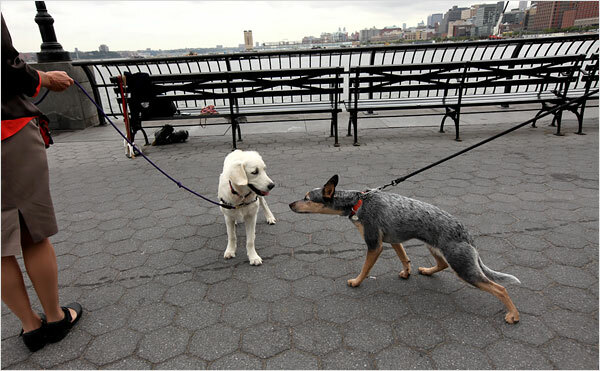 More via The Puppy Diaries – Scout Sniffs Out City Life – Series – NYTimes.com. The Puppy Diaries – Spare the Treats, Spoil the Training? – Series – NYTimes.com.